A short introduction by Dr Nathan Abrams, Bangor University and Gareth Roberts of ‘The Menter Fachwen Walk and Discover Project’ at 2.10pm. Come and share your memories of Wartski’s and Pollecoff’s stores and discover the fascinating history of the Jews in Bangor from Medieval times to the Second World War. The exhibition will be at the Gallery until April 26th. The Boundary Commission’s Final Recommendations Report for Gwynedd County Council was submitted to Welsh Ministers on 6 November 2018. There is a period of six weeks where Welsh Ministers may not make an Order. You may wish to take this opportunity to write to them with your views on the Final Recommendations. The six week period will end on 18 December 2018. The Final Recommendations Report contains all of the Commission’s recommendations for the County of Gwynedd. Where it has made changes to the existing arrangements a description of the change, the representations it has received, the reasons for any change and a map of the proposals are contained in the report. The Commission has now discharged its duties and it is now for Welsh Government and it’s Ministers to decide how to proceed. Ordinarily they will make an Order. The Commission would like to take this opportunity to thank all those who took the time to make representations as well as the County Council for their assistance in the conduct of the review. The War Memorial Cross, plinths, steps, slabs and naming slates have recently been repaired and renovated by the City Council as part of the 100 year Remembrance of the end of World War 1. Successful grant applications with monies from CADW and the War Memorials Trust as well as a contribution from the City Council have enabled the work to be undertaken. Works included cleaning, stone repairs, resin pinning, mortar re-pointing, brass cleaning, parapet, stone and blockwork repairs. It also entailed a refurbishment of the slate slabs and repainting of the lettering. 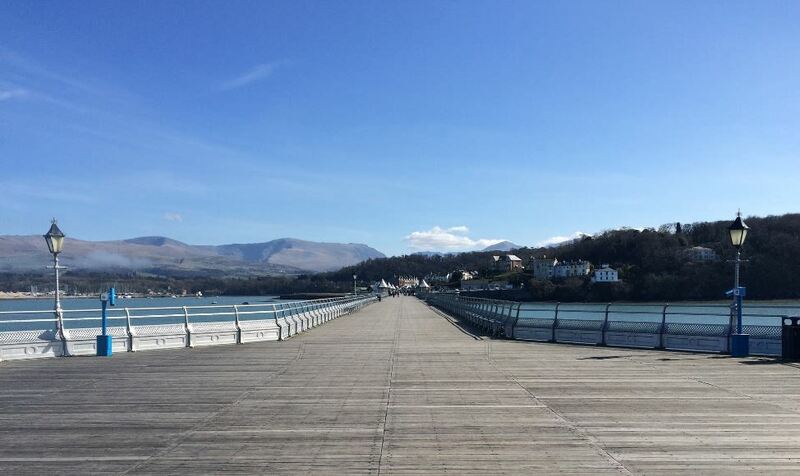 Bangor Pier featured in The Guardian newspaper last weekend for having one of the best views in the UK, from remote islands to city skylines, seascapes to moorland outlooks, Guardian readers shared their favourite landscapes. There is a 50p entrance fee and dog owners will be pleased to hear there is currently a trial in place allowing pets to join their owners for the relaxing stroll. There are very few stalls, as the pier’s main purpose is to provide breathtaking views in a peaceful atmosphere. The City of Bangor Council has dug deep into its finances to form a partnership with Gwynedd Council to keep open the three Gwynedd owned public toilets in the City. For 2018/19 the City Council will contribute £10,000 to ensure the toilets remain open as Gwynedd cuts bite deep into the public services provided in the City. From 2018 the Council will look at other ways of maintaining the provision of public conveniences. The three toilets are located at Glanrafon, Tanfynwent and Garth Road. The City Council’s own public toilet at the end of the Pier is unaffected as this is already maintained by the City. City Councillors felt it was imperative at this time of cutbacks that under-threat toilet provision had to be maintained and consideration was given to taking them over completely, however the Town Clerk informed the Council that taking them over was not an option available at present but could be feasible subject to conditions at a later date.